In Florida, the uncontrolled growth of an alga known as "red tide" has the state in emergency. The beaches of pristine waters now have a dark colour. The red tide has left tons of dead animals, has affected local businesses and has worried the inhabitants who do not know how long this phenomenon will last. Sanibel Island, a place of turquoise beaches on the Florida Gulf Coast, looks desolate these days. The palm trees, the summer houses and the colours of the tropics promise a perfect vacation, but the illusion disappears just when you reach the shore. There, the breeze brings a penetrating stench of rotten fish and the water, which is usually crystal blue, now has a copper brown colour. Dozens of dead fish float in the surf. "When the concentration of red tide is high it kills everything," says Dr Rick Bartleson, research scientist at The Sanibel Captiva Conservation Foundation Marine Laboratory (SCCF). The "red tide" Mr Bartleson refers to is a toxic microscopic alga, Karenia brevis, which every year comes naturally to the Gulf of Mexico. "This red tide has been off the charts," says Dr Bartleson, who has been studying the phenomenon for several years. It has lasted much longer and spread much more than usual. This season the toxic algae began in October 2017 and has since expanded by about 150 miles (240km) on Florida's west coast. The situation is so serious that Rick Scott, Florida's Governor, has declared a state of emergency due to impacts of the red tide in seven counties that include Collier, Lee, Charlotte, Sarasota, Manatee, Hillsborough and Pinellas. Since November 2017, the red tide has taken a toll on the marine life around this extremely diverse paradise. At least 29 manatees are confirmed to have died due to the toxin by the Fish and Wildlife Conservation Commission (FWC). Seventy-four more deaths are being investigated. The FWC has documented 588 stranded sea turtles and attributes 318 of them to the red tide. But the red tide can also affect people. According to the National Oceanic Service, sea waves can cause K. brevis cells to release toxins into the air, causing skin irritations and respiratory problems. For people with chronic conditions such as asthma, the red tide can make them very sick. The red tide is what scientists call a "harmful alga bloom". According to the FWC, there are many types of red tide in different parts of the world, but K. brevis is found almost exclusively in the Gulf of Mexico. The red tide occurs naturally, but scientists believe that human action worsens the problem. Year-round, K. brevis can be found in concentrations of 1,000 cells per litre of water. According to Mr Bartleson, who navigates every day around Sanibel beaches to monitor the K. brevis, a concentration of one million K. brevis cells per litre of water "kills everything". In recent measurements, he has found up to 50 million K. brevis cells per litre of water. "We have never seen numbers likes this before," he says. This exaggerated growth of algae has been linked to water contaminated with fertilisers used in agriculture, which reached the sea through several canals that pump residues on the west coast of Florida. The red tide has also stained the waters at Fort Myers Beach, 30 minutes away from Sanibel Island. But here there's another problem: the beach is full of another type of algae, a much larger seaweed that piles up on the shore. "It's also a consequence of nutrient loading," Dr Bartleson explains, "the grazers that could keep it in check have been killed or displaced by low salinity water or killed or disabled by red tide." The seaweed spreads like a carpet along miles of beach. The bloom is proving to be a blight on tourism. "A lot of people come from up north and since they are coming for the beach, they don't have anything to do," says Neiva Romero, who works in a Mexican restaurant close to the beach. "We don't have people at the restaurant, it's really bad." Tourists who stop coming will avoid an unpleasant experience, but locals have no choice but to deal with the tide. John Mayberry, a native from Fort Myers, says that although in recent days it has improved, a couple of weeks ago the smell of dead fish was so strong that it reached his car while driving near the bridge that leads to the beach. It is not possible to predict exactly when it will disappear, because the red tide presence depends on factors such as sunlight, the amount of nutrients and the salinity of the water, as well as the speed and direction of the wind and sea currents. Combating seaweed is not easy either. It is not enough to eliminate the organism; you also have to remove the toxin from the water. 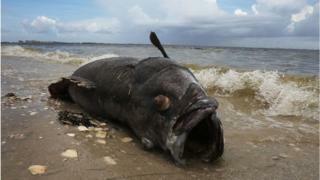 The FWC is clear about this: "Presently, there is no practical and acceptable way to control or kill red tide blooms." Under that scenario, for Mr Bartleson at least part of the solution seems obvious. "We can't control the currents, we can't control the winds," he says. "The only thing you can do is reduce nutrients [released to the water]." Daniel Medina, a captain who rents his boat for tourists who come to fish in Fort Myers, says that in recent days he has lost several trips because people are simply not coming. "I've been in the area for just under 10 years," he says. "This is the worst case [of red tide] I've seen." "People come down here for the water - that's what makes Florida so great. If we don't have that, what do we have?"